Since its launch in 2016, Stratis has evolved from the blockchain-as-a-service (BaaS) provider into a platform which supports the development of apps on private, enterprise-grade blockchains. The platform’s main currency is the Stratis token (STRAT). While the Stratis platform has changed its scope and tech over time, it never strayed too far from its main goal: helping the enterprises reap the benefits of the blockchain technology in a highly streamlined manner. The main idea is to combine the model of cloud computing with blockchain in order to reduce the pressure on the businesses to provide support for running a full-blown blockchain with their own resources. Implementation of blockchain technology can be desirable and profitable for businesses, but it often comes with huge price tags relating to the deployment of infrastructure, maintenance and security. Cloud-based blockchain services come at a lower cost as they are provided via web interfaces using remote infrastructure maintained by Stratis, instead of being maintained by the businesses which need those services. Even when companies have access to the blockchain, tailoring it to the needs of individual businesses comes off as a demanding process which the Stratis wants to simplify. With the Stratis platform, the organizations have an opportunity to get access to their own private chains which are customized based on their needs and available resources while being linked to the parent Stratis chain. Running a blockchain means that businesses often do not have full control over its features and that they are unable to ensure continued development of appropriate apps on it. With Stratis, the process of application development is simplified by allowing the use of C Sharp (C#) programming language, Microsoft .NET framework and other more frequently used systems compared to, for example, C++ in the Bitcoin Core. In addition to this, the Stratis personnel is available as a consultant in the process of building and hosting dApps and smart contracts with the help of the Stratis technology. How Does Stratis’ BaaS Model Work? c) Software needed for its management. The advantages of this approach supposedly lie in the fact that this approach allows the companies to refocus the time and resources they would spend on running blockchain on improving their daily business instead. At the same time, there is no need for them to hire expert personnel needed to run blockchain and pay attention to issues issues such as scalability. 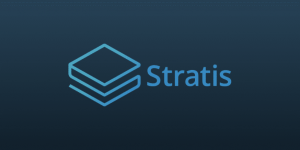 While the financial companies were the initial target group for its BaaS model, Stratis has since expanded its scope to target any business which wants Stratis to customize its ledger to its specific needs via APIs or lite clients. In 2018, the Stratis solution was made available in the BaaS segment of the Microsoft Azure’s marketplace. How Can Stratis’ Private Chains Help Businesses? Apart from offering blockchain as a service, Stratis aims to become the turnkey solution provider for businesses that want to create their own personalized blockchains or the sidechains. While these private blockchains are launched by third parties (companies, institutions or organizations) they are fully anchored to the main blockchain provided by Stratis. 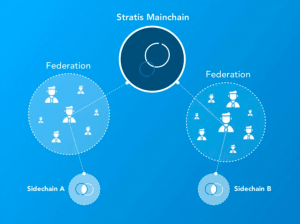 The sidechains are developed with the assistance provided by Stratis and the clients are able to access them via clients and APIs. Sidechains allow for the deployment of apps without the need for the maintenance of an entire network, as this option is often rather costly for businesses. In addition to lower costs, this option lends itself as an arguably more secure and stable solution, since the sidechains are linked to the main Stratis chain. Sidechains are presented as easy-to-use platforms for companies to test their applications running on the blockchain. In addition to learning more about their creations’ performance and familiarizing themselves with the blockchain technology, the companies can shorten the time needed for their applications’ deployment. Sidechains can have their own currencies. These currencies can be used as a means to acquire gas which is used for running smart contracts. These assets can also be exchanged for the STRAT token with the help of the system which enables the withdrawal of deposits. Sidechains are compatible among themselves, making it easier to manage the transfer of assets and values between them. Whatever their specific implementation may be, all Stratis users will have an opportunity to customize various operational aspects of their sidechains. This includes changes to their block sizes (if a businesses need to process a higher volume of transactions, for example), methods of transaction management and approaches to the storage of the metadata. While sidechains can operate almost independently, their security is derived from the Stratis parent chain as they run on the base code this chain was built on. Another important characteristic of the private chains is their autonomy from their counterparts, i.e. the Stratis platform makes it possible to introduce changes to one’s custom chain without this having impact on other chains on the same platform. What is One-Click Deployment System? In order to make the access to blockchain features easier and compete more efficiently with the likes of Ethereum, Lisk and Ark, Stratis had to implement a fast tool for the blockchain deployment, literally with a single click. The system named “one-click deployment” allows for the out-of-the-box functionality of deployed sidechains, together with the features of the Stratis parent chain. With its one-click node provisioning system, the Stratis users can also deploy sidechains to other crypto platforms (such as Bitcoin, Ethereum, BitShares and Lisk) and get access to the features that are not part of the Stratis package. In fact, the Stratis team invites its users to test different platforms they want to combine with their own solution, with the goal of bringing their use in line with their specific business goals. Newcomers in this field are also invited by the Stratis to use its consultancy services to make this transition to the most appropriate blockchain as smooth as possible. In addition to its focus on the blockchain and its business implementation, Stratis developers push their solution as a smart contract and ICO platform. a) The Stratis’ use of sidechains is described as a means to prevent the bloating which takes place when the number of smart contracts on a single blockchain gets too high. b) Security of smart contracts is also ensured by the separation of sidechains and the main blockchain which is protected from the various negative impacts a smart contract may have. c) Smart Contracts in C# undergo comprehensive verification during their deployment and before they are activated on the blockchain. 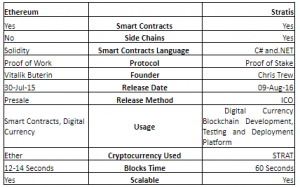 d) Due to the fact that all tokens developed on sidechains are pegged to the Stratis token, the gas used for running smart contracts is provided by them. The Stratis team has also created an ICO platform for launching initial coin offerings on its blockchain. This service is separated into various packages (the entry-level one is free to use) with customizable layouts and integration with the Changelly exchange for better currency support. What Is the Stratis Identity App? What Is Stratis’ Architecture Built On? Stratis Bitcoin Full Node. This segment is the “engine” of the platform and it runs its interface, infrastructure and node policy layers. It is also in charge of running the Proof-of-Stake algorithm which ensures the consensus on the Stratis network. Full Nodes on this platform hold a copy of the Stratis blockchain, with the support being provided for the Bitcoin blockchain as well. These nodes ensure autonomous validation of transactions and blocks on these two chains. The C# Full Node was launched in December 2018. LibConsensus is the library in which the Bitcoin Core provides a portion of the Consensus Layer code. In turn, the Consensus Layer manages the validation of blocks. NBitcoin is part of both the Consensus Layer and the Network Layer on the Stratis network. NBitcoin is a cross-platform Bitcoin implementation developed in C# which also uses Microsoft .NET framework. It is involved in the messaging between the nodes which exist as parts of the Network Layer. How Does Stratis Approach Scalability? Private blockchains on the Stratis platform are configurable, which means that businesses and individual users can determine the size of its blocks based on their needs and resources. Scalability should be more manageable based on the platform’s elimination of a single ledger and support for the deployment of individual ledgers on a host chain. The proof-of-stake model is seen as balancing the interests of end-users and the full nodes in charge of securing the platform. Which Industries May Profit from Implementing Stratis? Medicine. This is primarily related to the medical research field, as the results of these endeavors will be stored in the databases as immutable records available for perusal by researchers, reviewers and publishers. Product verification. Here, the Stratis blockchain aims to become the platform for the storage of information on verified and authentic products, thus reducing the chance of them being counterfeited and helping with their tracking. Financial industry. Stratis is seen as the technical foundation for the future fintech systems which would manage settlements, clearance, escrows, identities, know-your-customer practices etc. Supply chains. Verticals such as transport and tourism are increasingly relying on the Internet of Things which profits from fast and real-time consensus on their supply chain networks. Stratis is supposed to make these interactions less dependent on human interactions. The Stratis Token (STRAT) is the currency which ensures the transfer of value on the Stratis platform. The token holders reap rewards for staking the STRAT, provided that they have met the tier value required to run a node. The token also serves as the gas on the platform and is available as a means of payment for transactions on the network. In addition to this, the users can also invest in it by buying it on crypto exchanges such as Binance, Bittrex and Poloniex. The tokens can be stored in various ways, with the recommended one being the use of the officially supported wallets such as Stratis Core and Breeze Wallet. The ICO for Stratis took place between June and July 2016, raising 915 Bitcoin in total or approximately USD 675,000. As of December 2018, its market cap stood at more than USD 147 million, down from the historic spike of just above USD 2 billion from early 2018. The Stratis project is the brainchild of Chris Trew, an IT industry veteran with a background in finances. He joined forces with Nicolas Dorier, a key developer behind the NBitcoin which was incorporated into the Stratis platform, and one of the developers of the Bitcoin Core. The team has headquarters in the UK, while its members reside in various parts of the world.